As inverter air conditioner typically costs more than a standard non inverter air conditioning. But we believe that the cost saving in running costs will make up the difference in cost in no time at all. You will certainly notice a difference in the winter months when you use an inverter air conditioner instead of your old oil or bar electric heater. What are the benefits of an inverter air conditioning vs a standard air conditioner? 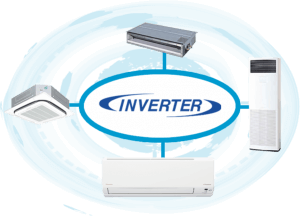 What is the difference between inverter air conditioner and a standard air conditioner? A standard air conditioner or fixed speed unit delivers a fixed amount of power. This means the compressor has to stop and start to maintain the desired room temperature which increases wear and tear. Inverter air conditioning, varies the speed of the compressors to deliver precise cooling or heating as required. The amount of cooling or heating required by an air conditioning unit varies depending on the outdoor climate and the climate of the room. When the heating or cooling needs to be increased, the compressor will work at a high speed and will increase the amount of refrigerant flow. The opposite affect will take place during moderate outside temperatures. When the heating and cooling capacity needs to be decreased, the compressor will operate at a low speed and will decrease the amount of refrigerant flow. Decrease your winter heating costs with an inverter air conditioner from Alair. Contact us today for a quote.